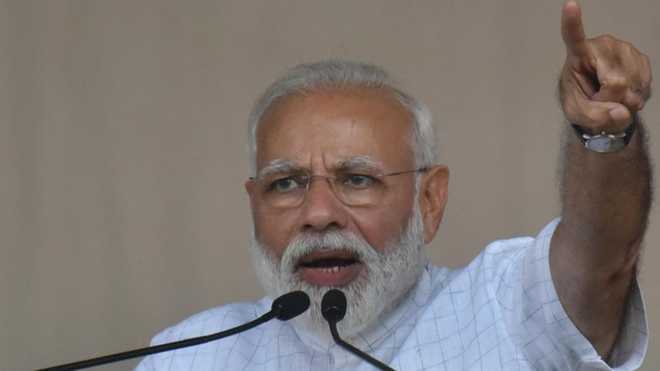 Kathua, Apr 14 : Terming National Conference, Peoples Democratic Party and Congress as ‘Mahamilavat’ (grand adulteration), Prime Minister Narendra Modi on Sunday wooed voters and asked them to end decades old dynasty rule of these political parties in the state of Jammu and Kashmir. “Some are threatening of two Prime Ministers, some are speaking language of anti-nationals but I want to make them clear that Jammu and Kashmir is an integral part of India and their ‘vanshwaad’ (dynasty rule) will never survive for long,” said the Prime Minister. The Doda-Udhampur Lok Sabha Parliamentary Constituency will go to poll in the second phase on April 18. "Earlier Pakistan also used to give us Nuclear threat but, what happened? Their balloon of threats has ultimately got punctured," he said. Remembering Dr Bhim Rao Ambedkar on his birth anniversary, Mr Modi added that Dr Ambedkar way back in a rally at Punjab had said that ‘vanshwaad’ weakens nation, adding, "I want to make clear to Congress and other ‘vanshwaadi’ (dynasty rulers) families including NC and PDP that I (Modi) am standing like a wall in front of them and will not allow them to be dictatorial in the state." “These families have sucked the blood of people of J&K since long and I want to challenge them that let them field their entire relatives into polls, abuse me as much as they can, but I will not allow them to succeed in their nefarious design of dividing India,” he maintained. The Prime Minister said that the country is facing the brunt because of the six decades long misdeeds of the Congress party, adding, “how shameful that Congress is now seeking vote on removing army from the J&K by revoking Armed Forces Special Powers Act (AFSPA)”. “Congress can never be trusted. After ruling for decades, they are sacrificing our forces and have no importance for them,” he added and said that it is only because of the wrong policies of Congress party, Kashmiri Pandits had to leave their homes. “We will try to settle refugees and also consider their citizenship rights,” said Mr Modi. He however, said that on May 23, poll results will be declared and ‘Phir Ek Bar Modi Sarkar Banegi’. “Your one vote got reservation for border residents, 10 per cent reservation to poor people, benefit for farmers, LPG, power connections, Rs 5 lakh free health insurance for needy, opening of Shahpur Kandi Dam, AIIMS, GMC Engineering Colleges,” he said.